Where is it? : The Murray Mouth is about 13km SE of Goolwa. There is a car park and lookout opposite the Murray Mouth on Hindmarsh Island. The area takes in the SE tip of the Sir Richard Peninsula, NW tip of the Younghusband Peninsula (Coorong National Park) and Sugar’s Beach (Coorong National Park) and all the waters within (Coorong National Park). 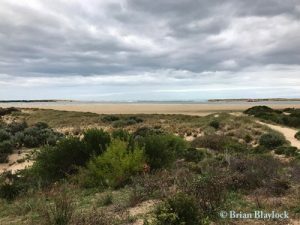 History: Section 590 was added to the Coorong National Park on 11 December 1975 and Allotments 1 and 6 were added on 23 August 2001. Habitat: The area is mostly open water with large areas of tidal flats at low tide. The land areas have typical coastal dune vegetation with Coastal Daisy (Olearia axillaris).